What the heck are tire socks? Here’s a review. So last week we had to chain up for the first time. You can read that whole story in my last blog entry. It was kind of crazy. Winter is certainly here, and it's already been a little crazy! We got back to the office and a discussion ensued. Were the cables we were carrying legal or not? The Caltrans (California Department of Transportation) guys at the checkpoints in the middle of a slushy snowstorm said they weren’t. A lady we spoke on the phone said they weren’t. Our crew at work tried calling the same number but no one answered or returned their calls. Three different people at our office searched the caltrans website finding no specific information on what SIZE cables were legal or not. Everything was very vague, usually just referring to chains and “other traction devices,” and that’s it. So… were we crazy? It probably seemed so. I guess this opened up the discussion of arming us with the latest technology in traction: tire socks. Caltrans clearly weren’t fans of the socks when we went through, saying the only reason they were legal was because “someone was greasing the pockets of politicians.” I don’t exactly know what that means or how it works, but two separate caltrans dudes told us the same thing, nearly word for word. Makes me wonder – are they trained to say this? I’m already feeling skeptical after they convinced us to buy $300 in chains last week. I don’t know. I don’t have anything against chains, especially since I know how to install them now. But honestly? They’re a pain. They’re heavy, they’re tricky to get tight, and they can fall off. They’re also tough on tires and equipment. The tire socks on the other hand? They are not a pain. They kind of rock, actually. 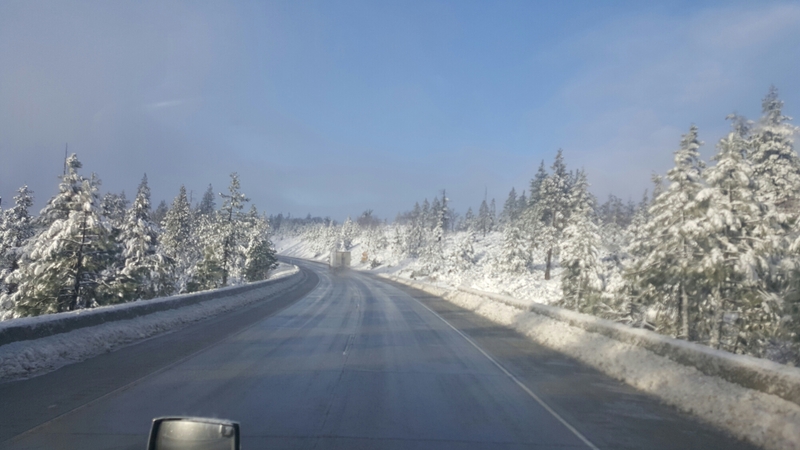 We ended up having to use them over Donner Pass in California again, only we had to start at the Nevada border this time, instead of just the summit like last week. The socks - installed, driven on, centered and secure. So here’s a review of our first use of them – a brief description of what the heck they are and how they work, installation and a downside we discovered, too. Keep in mind this is one use in one particular weather situation (16 – 24 inches of snow at the summit). I can’t really speak for other unique weather situations. But we did get a good feel for them on this week’s trip. So what are tire socks? AutoSock, a high-technology textile tire covering, utilizes GripTech® technology. 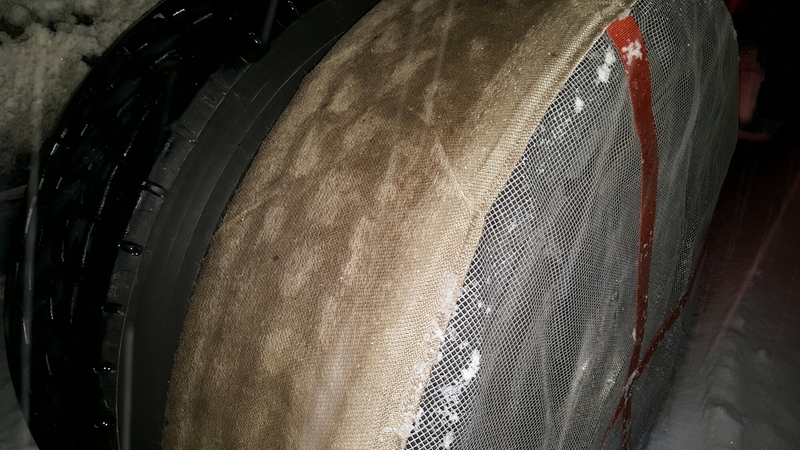 Specially patterned fibers optimize grip on slick surfaces by managing the thin layer of water on top of ice and snow. Through its weaving pattern and thousands of small fibers AutoSock clings to snow and ice, increasing vehicle traction, improving safety and adding to driver confidence. This is what they look like installed, brand new, before rolling on them at all. I also read somewhere on the website that snow won’t stick to the fabric, like you might see with wool, for example. You know, the little icy cling-on snowballs when you’re trying to roll out a snowman. They don’t do the cling-on thing. So yeah, little fibers. It sounds crazy, but I think they actually work! Our first time installing these in the cold and sloppy snow took a tiny fraction of time compared to our first time with chains. They are stupid-easy. 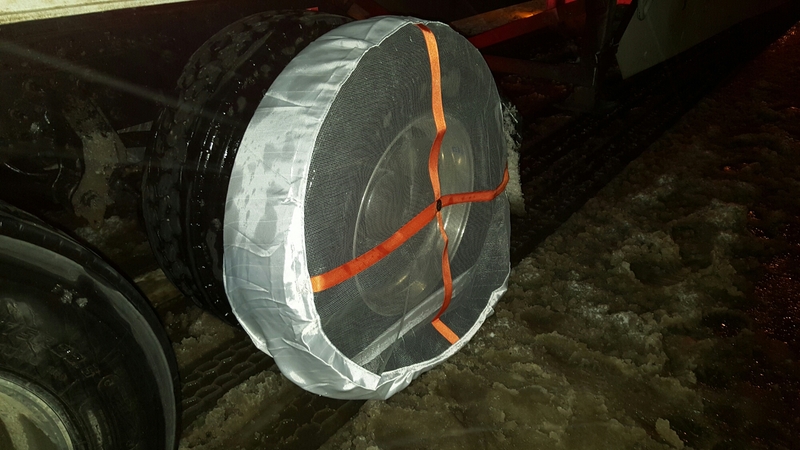 You just drape the sock over as much of the tire as you can, roll the truck forward or back about three feet, then pull it the rest of the way on. It’s elasticized, so it kind of wraps tightly around the tire. This one is half-way on. Then we roll the truck a few feet forward and pull the loose side on over the other side of the tire. Done! If they’re not perfectly centered, no worries. We rolled forward and back a few times like you’d do with chains to make sure they were on securely, and they were. And sure enough, we checked again a mile or so down the road and they were all perfectly centered and looking solidly secure on the tires. Self-centering! Nice! I felt pretty confident they were going to stay on. And they all did – for the entire 50+ miles we had to drive with them on (it was a longer stretch this week!). The downside to these crazy things? Wear. First of all, they’re pretty expensive. They are sold in sets, and the four sets we got (eight socks total) cost about $900. Youch. I’m not sure how many uses you can get out of them, or more specifically how many miles you can put on them, but inspecting them after their first 50 miles, they generally held up well. I’d be comfortable using them again, and we’ll have to reassess their condition then. Here’s the downside part – as we were driving, we were able to dodge four out of five chains in the road that other trucker’s had lost. The one I did run over was covered in snow so it was hard to identify it as a chain, and there was another truck passing me on my left so I couldn’t really swerve around it. I wouldn’t want to swerve for something on an icy road, anyway. Running over that chain ripped some holes in one of the socks that was covering a trailer tire. Our safety guy theorized that when it rolled under my front steer or tractor drive tires, it got jumbled up, then wrapped around that trailer tire, causing more than just one rip. So we’re not exactly sure that one sock is legal any more, or how less effective it will be now. 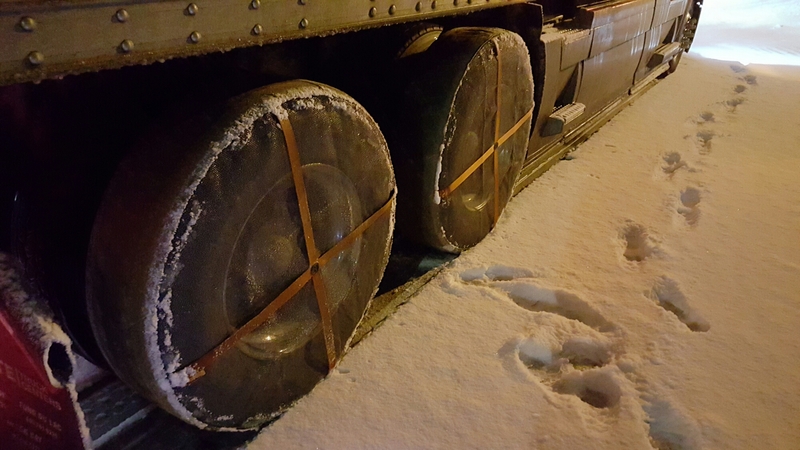 We have a spare set (only three sets are needed in California when max chains are required), so we’ll hang on to the damaged one as a spare or something to throw on in an icy driveway for dropping a trailer (for example). The damage. A big bummer. How did they grip compared to chains? This is hard to tell. The important observation is that we stayed on the road! It didn’t feel like we were sliding around at all, but we were also going 20 mph the entire time we had them on. Sidenote: 20mph is the recommended max speed you want to drive when the socks are on the tires. I believe going too fast, accelerating too quickly or braking too hard could possibly bunch them up and cause them to pop off. You also want to drive very slowly with chains on, so it’s not like the 20mph speed is a disadvantage to the tire socks. With chains on, you really feel them clattering under your tires, and this kind of gives you a confident feeling like, “Wow. These are really doing their job digging into that snow!” Whether or not that’s true, I don’t know, but history shows they’re effective. With the tire socks you don’t even feel them on. The truck feels smooth and normal, so you don’t have that hard, clunky grip feeling, but this new technology from AutoSock has apparently been tested in a lot of different situations and I guess they hold. They did for us! If you’re installing tire socks in California, Caltrans will lecture you when you go through the checkpoints. As I mentioned, they really have something against these things. 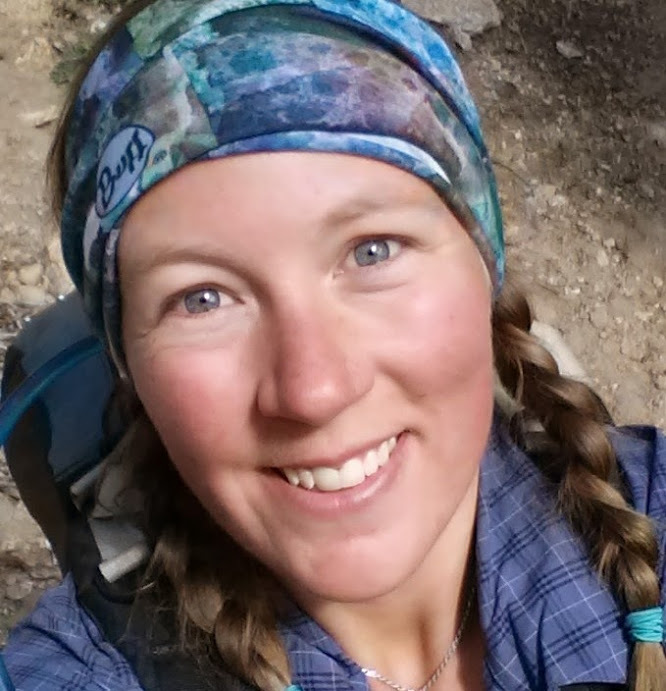 In fact, one guy told us they’d be ripped off by the time we got to the summit, but we found that hard to believe because he also told us we had 3,000 more feet to climb at that point, which would’ve put us at 9,000 feet. The highest we get is at the summit (Donner Pass), which is 7,000 feet, so he was oh… only 2,000 feet off. That’s a big difference in this situation! One of two Caltrans check points. They don't let you through if you don't have the proper chain set up. 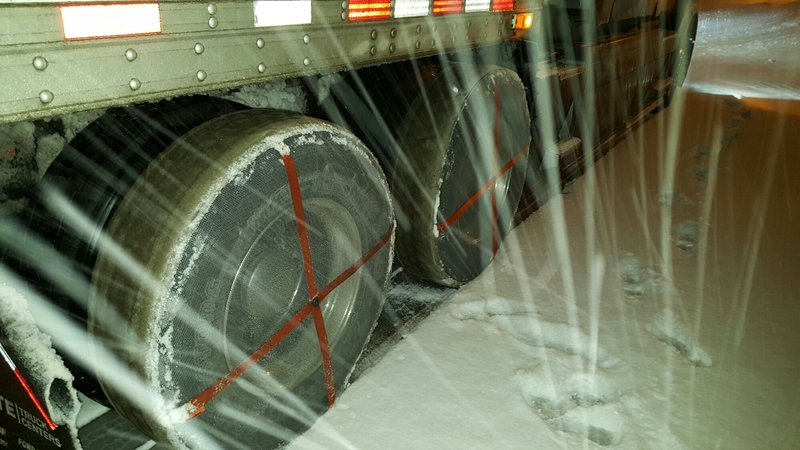 If using socks in a MINIMUM chain law area (one set on the drives and one set on the trailer), you must use the MAX configuration with the socks, which is a set on both drive tires, and one set on the trailer tires (so three sets total instead of two). Second, Caltrans will warn you that if you get stuck up there with socks on, “You get NO second chances. You get towed back to the STATE LINE (Nevada! ).” Apparently they just pull you out and send you on your way if you have chains on? It’s a question – I don’t really know. They are machine washable! For some reason I just find that kind of funny. Not sure I’d want them in my home machine, though. They pick up quite a bit of road grit and sand. You’d at least have to be sure to shake them out really well first. How they look after driving on them (and not running over a chain). Still in good shape! Just a couple more tidbits – first, don’t let them freeze. Don’t park overnight with them on or store them used and wet somewhere they could freeze. Second, obviously, try not to run over thrown chains when you have tire socks, but don’t drive off the road to avoid them, either! And last, if you’re in a situation in which chain laws are in effect, shut down if you can. It’s really the safest bet. If you do proceed, please drive slow, safe, and courteously. Well, that turned out to be quite the long review, but what else would you expect from me!? If there are any other tire sock users out there that have experience using them and would like to add to this review, please comment! Thanks! Tonight I love NOT having to chain or “sock” up. And out come the tire chains! So there I sat, in the driver’s seat, parked. Waiting. My pants were soaked from the thigh down from kneeling in slush, but they were starting to warm up and dry off, thanks to the truck’s heater. I stared at all the other trucks slowly rolling by, sort of enjoying the cling-cling-cling of the excess chain links spinning and whapping up against the trailers and the thud-thud-thud of them against the snow-packed road. It was a new experience for me. The chains part, anyway. I’ve had a flat tire before. 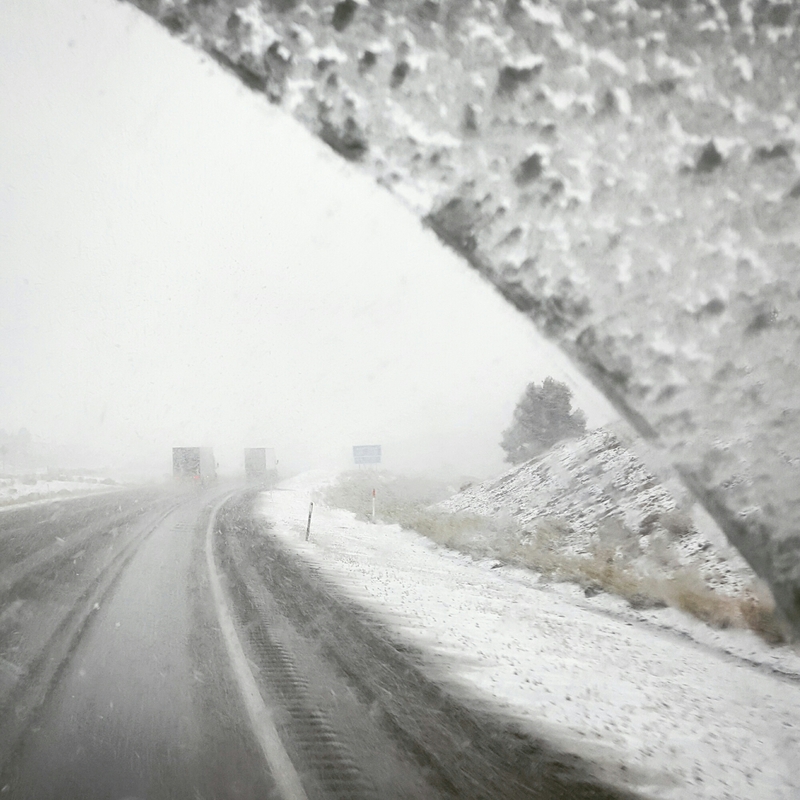 This time is was during a snowstorm, right at the summit of Donner Pass (California). And chain restrictions were in effect… and I had wet pants. This whole situation was just uncomfortable. That's a pretty natural, honest expression on my face. Excitement and nervousness combined. 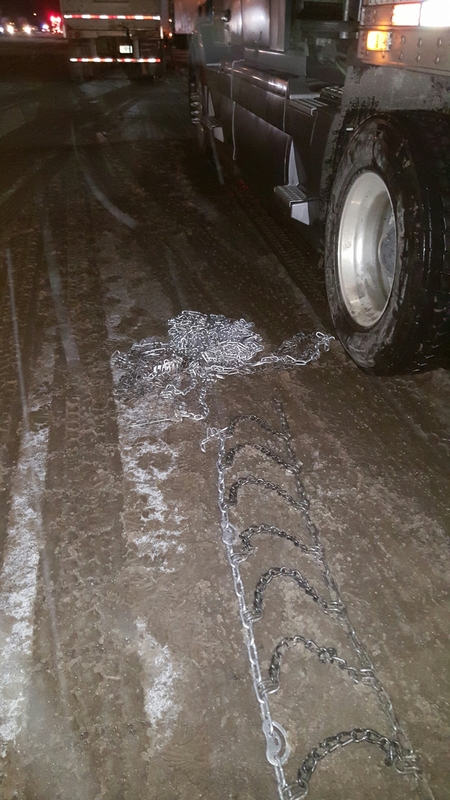 We finally had our first experience chaining our truck, and I can’t say I’m surprised that it was not a simple ride. Is there really a Grapa curse? I wonder sometimes. I got up around my normal wake time of 1:30am. Adam said chain laws might be in effect at Donner Pass, which we were approaching. Now there’s a lot of thought processes that go on in situations like these. 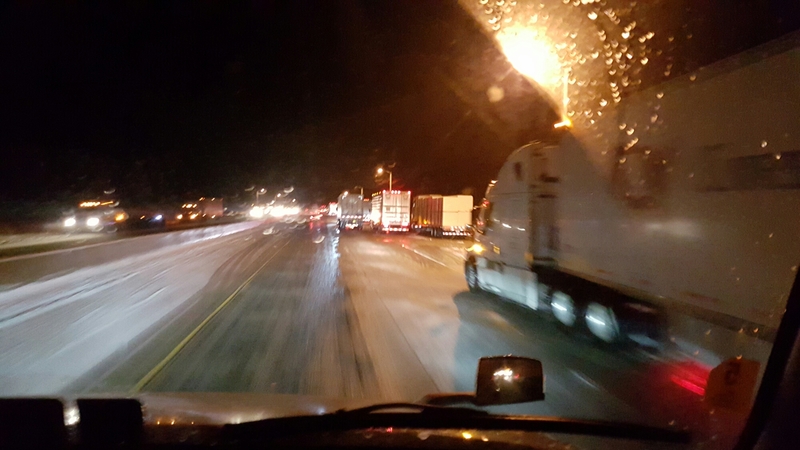 Normally we’d prefer to just shut down and wait for the chain restriction to be lifted. And usually the reason the chains are needed is because of crappy roads. But a series of things happened in just the right order in which neither of us even questioned it. We were going to chain and go. First, Adam saw a “chains required” sign with yellow lights that flash when the chain law is in effect, but the top of the sign where the lights are was covered in snow, so he couldn’t see if they were on or not. The Caltrans website wasn’t very clear about whether chains were needed or where, and when I called 511 it said nothing about the situation. We were questioning whether or not we could just keep rolling. 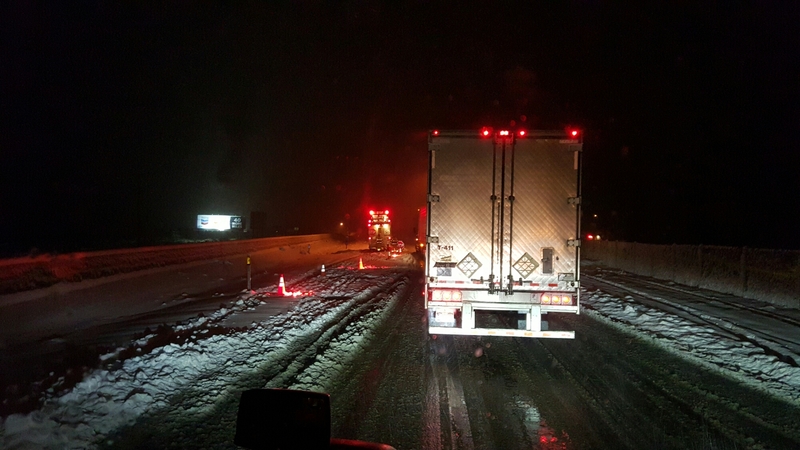 We approached a chain-up area full of trucks, four-ways flashing, all squeezed in, parked in unorderly chaos, drivers walking around, chains laying out next to tires. We pulled over and another driver approached us asking why everyone was chaining because he didn’t see any signs that saying it was required yet. Neither did we, so we decided to keep going. 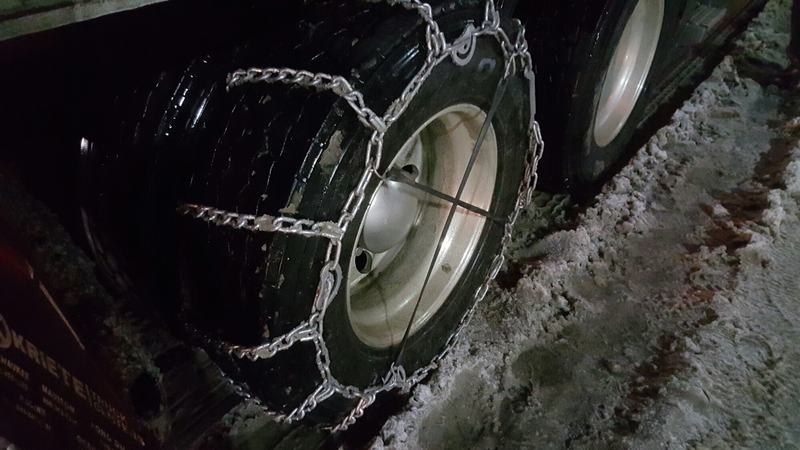 Why go through with chaining tires unless we have to, right? Besides, it was kind of nuts in that spot. A little further up the road there was a checkpoint and a stop sign. Caltrans was directing chained vehicles through and unchained vehicles to the exit to turn around. Well, this was it. If we turned around and found a safe place to park and wait, there was a 100% chance we wouldn’t be able to make our deliveries. At all. This is a problem with our run because our delivery day is a Friday and these places are closed for the weekend. If we couldn’t make it, would we be stuck in California until Monday when they reopen? Normally we would be totally cool with that, but my parents took time off of work to meet us in Appleton for a little Christmas get-together, and we were really hoping to get back to see them. We even had a pretty nice backhaul set up. This all went through our minds in a flash, as well as knowing a fellow team from our company chained and went through this same spot a few weeks prior. And it wasn’t like we were in Wyoming where the road is crap for 150 miles straight – this would only be about 10 – 15 miles, then clear sailing. We were not parked in a safe place. If we sucked it up and chained, we could still make our deliveries. We didn’t really discuss it much. We both had the same thoughts and just decided to go on. So we went to work. Prepping chains. Wish I would've gotten a pic of the cables. 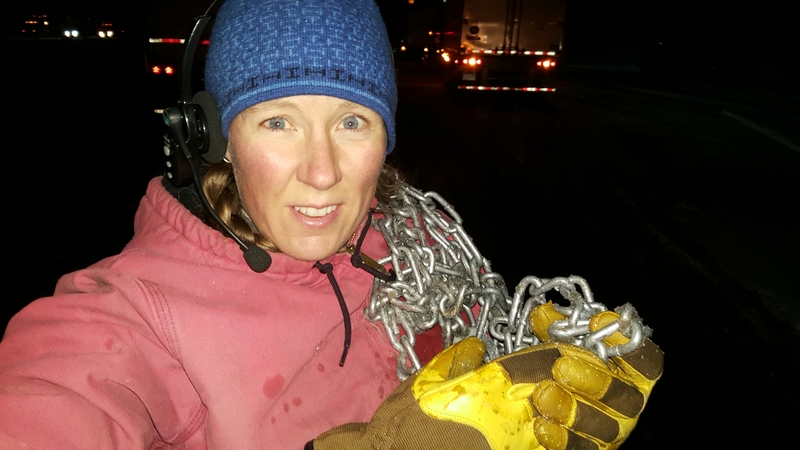 As we were laying the chains out to check for kinks, two Caltrans guys in full safety-green snowsuits with reflective striping came by asking us to pull up further to apply our chains, then stood over our setup and let us know our cables weren’t legal in California. Oh. Great. 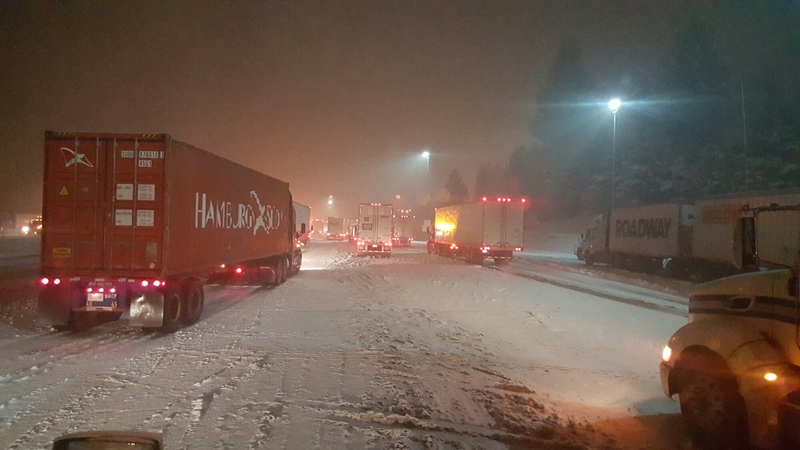 California requires trucks to carry four sets of chains, even when chain laws are not in effect. 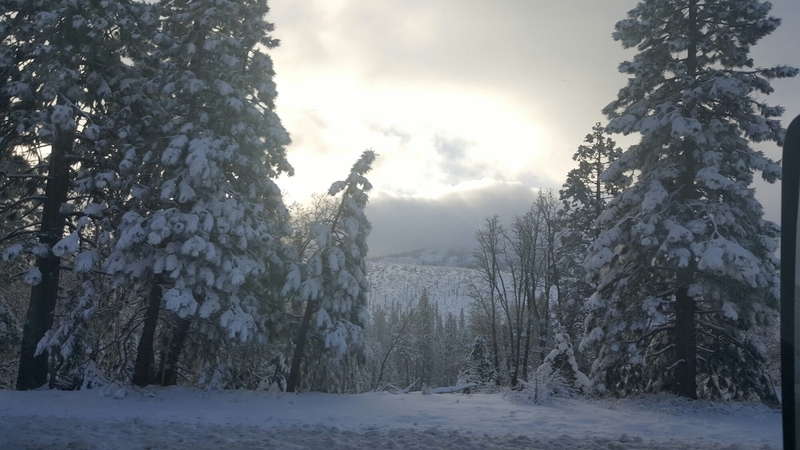 We asked what our options were, and they said if we couldn’t get more chains we’d have to go back to Sparks, Nevada to purchase some just to drive through on a normal day. There was a dude up ahead that was selling chains out of the back of a small RV. He also charges to install them for you. What a job! Thankfully he still had some for sale, and thankfully we had $300 on us to pay for them. We threw the heavy bulk over our shoulders and walked back to our truck. We were going to have to learn this eventually. Why not now? After pulling up a little further we got started. A driver next to me was just about to head out, but he gave me a few pointers before he left. I think he was able to tell I was a rookie chainer. I’m sure it was obvious! 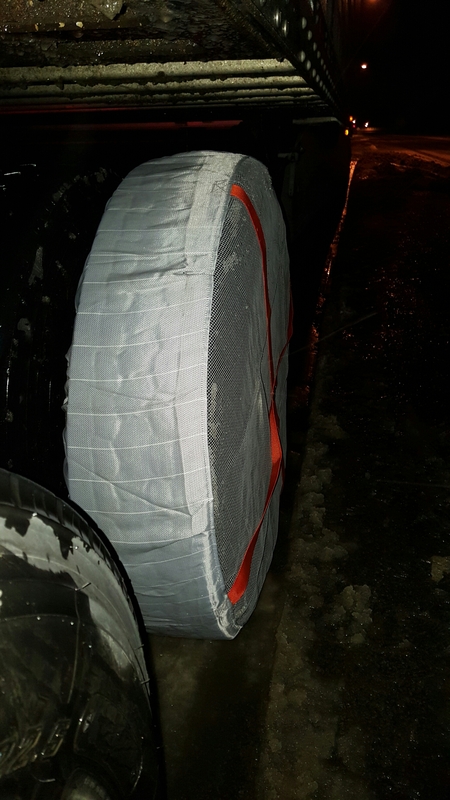 Between what he told me, YouTube videos, and online written directions, I knew to drape them over the tire nice and centered. Make sure the dogpaws (a hook that connects the chain parts together) were facing out so they don’t rub on the tire. Tuck the remaining chain under the tires, then back over them. Hook the loose ends together and get them as tight as possible before locking in the cams (there are four cams on each chain and they turn and lock to tighten up the slack in the chain). We did all that, and I thought we had them as tight as we could get them. We even strapped two bungee cords across to hold them even tighter in place. The whole process of moving, buying chains, and installing them took us two hours. 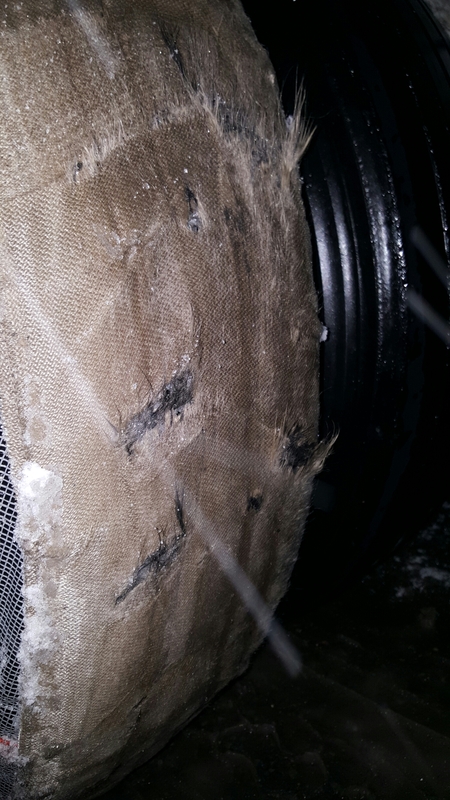 We were cold and I was soaked from kneeling in the slushy snow so I could reach in behind the tires to connect the chain hooks. After wringing out my Thinsulate gloves, we got back in the truck, I stripped off my wet bibs, cranked some heat, and we rolled through the checkpoint with a wave from a Caltrans lady. Now you’re supposed to stop and check the chains within a mile to retighten them once they get settled onto the tire after driving on them a bit, so I planned to stop at the summit rest area (which was closed due to being plowed in). About two minutes from the summit our central tire inflation (CTI) warning light came on. [Sidenote: Central Tire Inflation supplies air to the tires if one has a leak so it can stay inflated long enough to get it serviced. If the device is putting extra air into a tire because of a leak, the light illuminates on the trailer to let you know something is wrong.] I pulled over as close to the snowbank as I could to get off the road and walked back to check the tire. Air was hissing out of it. I thumped it with the hammer and a low THUD came back. It was definitely flat. And on top of it, our chain was gone. We lost a chain and I didn’t even feel it. That is an unsettling realization. I wondered if I would feel it if I lost one and now I know. With the way the chained tires clink and thud as you drive along on the road (max speed with chains is around 25mph), it was impossible to even notice. That should be the end of our bad luck, but then our trailer ABS (anti-lock break system) warning light came on. We were lighting up all over the place! We finally gave up trying to figure out what to do with air steadily hissing out of our tire, our ABS light on, being new to the whole chain thing, and being stuck in a stressful spot that I didn’t even know whether a roadside truck would drive to or not. By this time it was 5am. We called our maintenence guru to help us out. He talked us through turning the CTI off, because the chain that came off must have severed the line that carries the air. We tried a few tricks to reset the ABS light, but it didn’t go off until about an hour later (but thankfully it did go out on its own – it’s illegal to drive with that ABS light illuminated and can result in a violation). 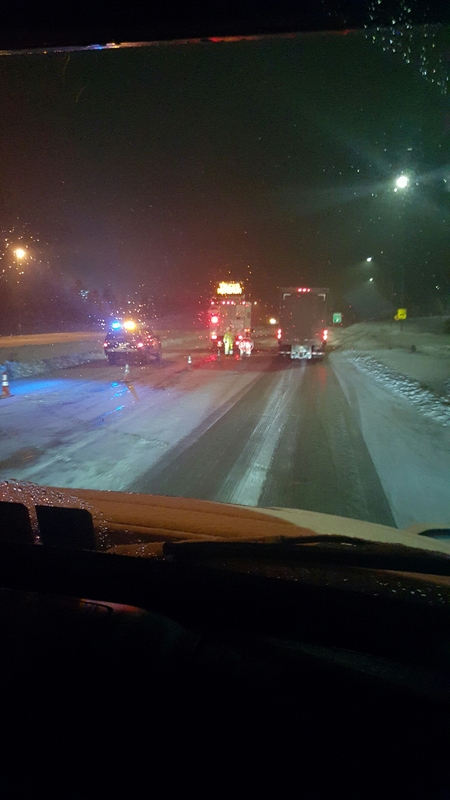 After about two hours waiting on the roadside, watching plows come within inches of our truck to plow around us, and seeing another driver get stuck in a snowbank behind me (a plow eventually plowed him out), our roadside service guy showed up. They did brave the weather and road conditions! Yay! Another hour later, he had a new tire on us and even checked our chains for us. He recommended we tighten them a little more, so we spent yet another hour tightening the remaining three chains and applying a new one where the last one fell off. It was only about seven miles down the road and were able to take the chains off. The road cleared up and I was able to cruise on like normal the rest of the way. We were super late for our deliveries, but our dispatch made some calls and they stayed to take us. I did have to sweet-talk some forklift drivers to remove three pallets to get to their nine pallets because we delivered out of order, but they were really nice and did it with only a little friendly harassment. So there. Now we know how to chain. It actually feels like a bit of a weight is off our shoulders now because we know how, yet there’s still a lingering anxiety because just being in a situation where you need to chain is scary in itself. Sometimes this job is just hard. Physically and mentally. I was totally burned out by the end of my shift on Friday. So was Adam. He was up that whole time helping me instead of sleeping like he normally would be. But we did it, and I can’t help but feel a little pride in how we handled everything – even though it didn’t go exactly smooth. And maybe I’m feeling a little tougher, too – in a badass kind of way because now I can chain truck tires. Tonight I love the scenery snow leaves behind because it’s so pretty it can literally make my stomach hurt with joy. Yeah. It was achingly beautiful.